It’s been a month and a half since I made the decision to take care of myself and join Weight Watchers. I thought I’d give an update in the form of “weight loss – what I’ve learned”. Believe me, I’ve learned more about myself in the past 1.5 months than I ever have in my past efforts at weight loss! I can’t emphasize that enough. Weight loss is a mental challenge. The mental part is, in my opinion, the hardest part of losing weight. Learning to CHOOSE to be healthy is hard. Let’s face it, it’s a CHOICE to eat donuts and candy instead of fruits and vegetables. Keeping up with the program and not beating yourself up when you have a bad day or even a bad week is hard too. It’s easy to say “screw it” when you don’t lose as much as you had hoped, or God forbid, you gain that week. Pick yourself up, tell yourself it’s ok (because it really is ok), and get back on track. Learning doesn’t happen without some failures. Lose weight for yourself and no one else. Don’t go on a weight loss journey because your husband told you that you’ve gained weight since having kids. Don’t go on a weight loss journey because your doctor told you that you need to lose weight. Do it for YOURSELF. Lose weight because YOU want to be healthy and YOU want to feel better. Losing weight for reasons other than yourself is a failure waiting to happen. 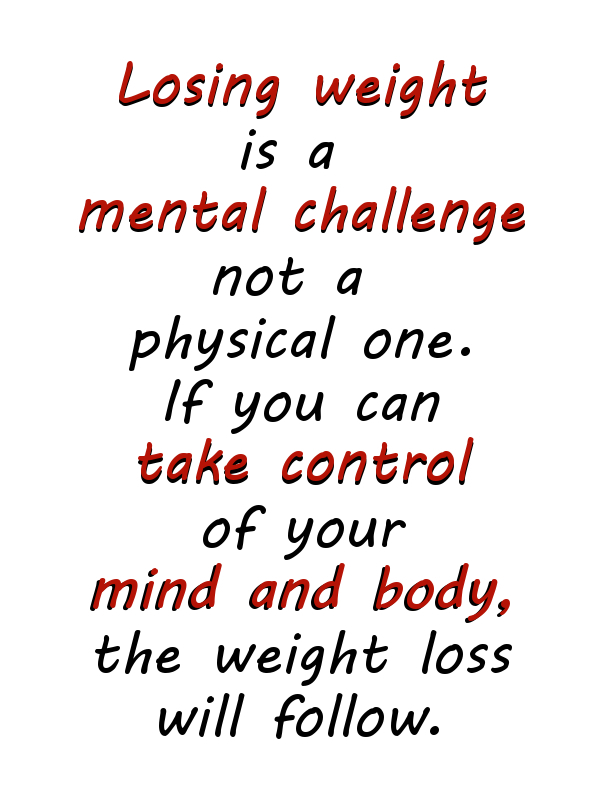 Weight loss is your mental challenge and no one elses. As I mentioned, weight loss is YOUR mental challenge and no one elses. You have to own it and take control of it. It’s nobody’s fault but your own that you ended up with the extra weight. Own that. Once you realize that that it’s you and you alone, you can figure out what you need to do to fix it. Owning your weight loss is the first step in overcoming the mental challenge. Second step? Realizing that you are worth it! Those who lose weight and gain it back again went on a weight loss journey and did not make a lifestyle change. Don’t restrict your diet during your weight loss and tell yourself that you can eat those things once the weight comes off. Going back to old foods/habits brings the weight back. Learn to incorporate the foods you like into your “diet” now (through moderation) and it will be easier to keep the weight off in the long run. Don’t ditch those healthy foods you’ve been eating during your “diet” once you hit your goal weight. Those healthy foods are what’s going to keep the weight off. You want to eat the same during your weight loss as you will once you lose the weight. I’ve lost 16 lbs in the past 6 weeks and it’s been easier than I thought it would be. I’m not hungry, I don’t feel deprived of anything, and I feel great! Wanna know why? Because I’m losing weight the right way. I’m determined to do this for MYSELF. 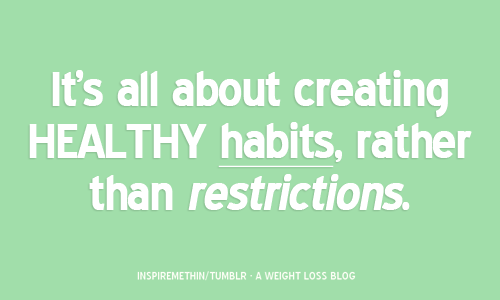 I’m choosing to eat healthier and be happier. I’m looking at food from a nourishing standpoint instead of an immediate gratification stand point. What foods are going to fill me up for longer periods of time not just satisfy my immediate hunger? I’m learning that I need to change myself and my lifestyle in order to change my weight. I am owning this and I am ROCK’IN it! 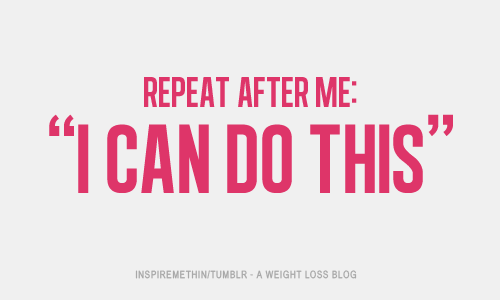 Weight loss – what I’ve learned…in short, I’ve learned I CAN do this. The difference between now and previous attempts? My attitude and my attitude alone. Really, that’s it! Sure I joined Weight Watchers and now I’ve got some tools to help me out, but those tools don’t work without the attitude to go with them. So what does my future hold? I have a 43 lb weight loss goal (27 lbs to go!). To go from 178 lbs to 135 lbs. That weight loss puts me at the top of my “ideal weight range”. I’m not looking to be pre-kid weight. I just want to be healthy. My goal is to become a Lifetime Member of Weight Watchers (get down to a healthy weight and keep that weight for 6 weeks minimum). As a Lifetime Member I’ll have the tools and support to go along with my lifestyle change. I’m determined to lose the weight and keep it off. I’m learning how to do that from my own mistakes as well as other’s mistakes. I can and will do this!